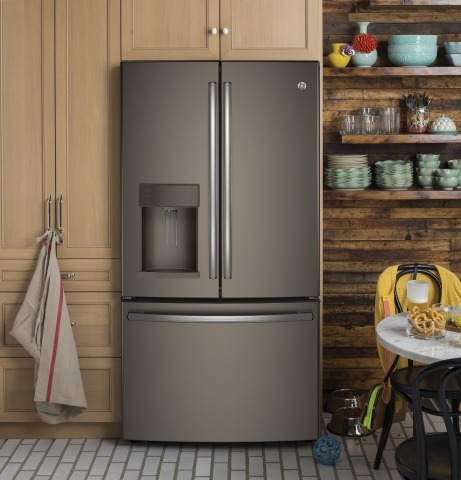 BOSTON--(BUSINESS WIRE)-- Wayfair Inc. (NYSE:W), one of the world’s largest online destinations for the home, today announced it will expand its current appliance offering to include GE® and GE Profile™ appliances as part of its innovative shopping experience. For the first time, best-selling GE products including washers, dryers, ranges, dishwashers and refrigerators are available on Wayfair.com and ready for delivery in 25 U.S. cities with nationwide roll-out in early 2018. Shoppers will now have convenient online access to an assortment of GE products, and for the first time, will be able to view GE appliances in their homes and explore 3-D imagery of a wide selection of appliances through Wayfair’s seamless digital shopping experience. With two-day delivery available in most markets, customers can also conveniently schedule the preferred delivery date for their new appliance. As part of Wayfair’s specialized appliance shopping hub, customers can now explore, discover and compare GE appliances with greater convenience than ever before. The all-new WayMore shopping experience leverages Wayfair’s advanced technology, allowing shoppers to learn about the unique product features such as built-in Keurig® K-Cup® Brewing Systems in refrigerators, or Wi-Fi connectivity that uses voice-control technology to heat water for coffee or tea. This new shopping experience also provides a detailed product overview including dimensions, available finishes such as stainless steel or slate, protection plans, and shipping and return info. “At GE Appliances, we are passionate about a great experience for our product owners, and we partner with resellers that create that for our brand. Wayfair has invested in a platform that brings our products to life digitally, and we look forward to reaching new consumers with our brand and a world class digital experience,” said Lauren Whitsell, general manager, sales operations, GE Appliances. Wayfair believes everyone should live in a home they love. Through technology and innovation, Wayfair makes it possible for shoppers to quickly and easily find exactly what they want from a selection of more than 8 million items across home furnishings, décor, home improvement, housewares and more. Committed to delighting its customers every step of the way, Wayfair is reinventing the way people shop for their homes – from product discovery to final delivery. Wayfair generated $4.3 billion in net revenue for the twelve months ended September 30, 2017. Headquartered in Boston, Massachusetts with operations throughout North America and Europe, the company employs more than 6,800 people.